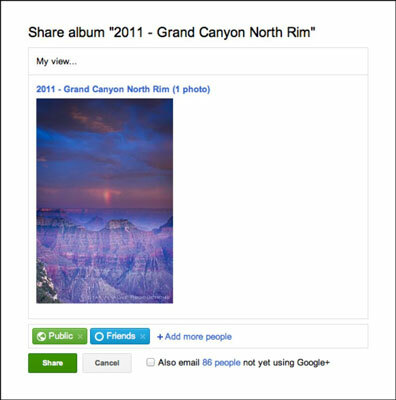 After you’ve uploaded some photos to Google+, you may want to share your photos with your friends. You can always just upload the photos with your posts on Google+ and share them that way, but you may want to share a photo or two after the fact. Click the album you want to share. Click the Share Album button at the top. See the following figure. A pop-up box appears. This is the same type of dialog box you use to post your updates to Google+. Choose the circles you want to share with, enter a message to go with it, and your album will be shared with your stream. Sharing photo albums to your stream.